This Thursday, FC Barcelona has announced the extension of its sponsorship agreement with Beko for the next three years. A joint press conference in the Auditori 1899 at the Camp Nou was the venue for the formalisation of an agreement whereby Europe’s leading household appliance brand becomes a Main Partner of the club and the Official Sponsor of its training uniform. The event was also used to publicly announce Gerard Piqué as the ambassador for the ‘Eat like a Pro’ campaign. The event was attended by the president of FC Barcelona, Josep Maria Bartomeu; the vice-president of Koç Holding, the biggest conglomerate in Turkey and Beko’s parent company, Ali Y. Koç, as well as Barça first team player Gerard Piqué. This new agreement is a major step forward in the growth foreseen by the Strategic Plan passed by the Board of Directors for this mandate, and is part of the club’s target of proactively seeking out the most suited partners to its own defining values and traits, and to find the world’s best sports marketing contracts in each category. 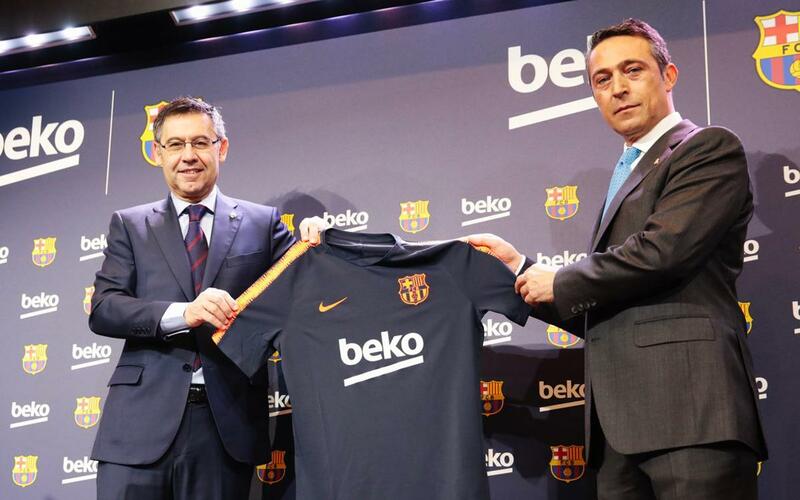 As a result of this agreement, the Beko logo will be appearing on the front of the first team training kit, as well as on the back as it has done until now. The logo will also be remaining on the left sleeve of the playing strip as has been the case since the 2014/15 season. The Barça defender is to become the global ambassador for a Beko initiative called Eat like A Pro. On the premise that both FC Barcelona and Beko share values rooted in the desire to make a difference to people’s lives both locally and globally, the aim of the programme is to help tackle the worldwide epidemic of child obesity by teaching children and parents about the importance of a healthy diet by highlighting the way their sports heroes eat in order to perform to the maximum. Founded in 1969 in Istanbul, Beko is the international household appliance division of the Arçelik Group. With a wide range of both small and large white goods, Beko is ranked as the market leader in Europe. It was Europe’s fastest growing brand from 2000 to 2016. Beko is one of the leading brands in its market in the United Kingdom and is number for white goods in France and Poland. In the last five years, it recorded the biggest growth in Germany, Europe's largest household appliance market. “Today we are celebrating and formalising a strategic partnership agreement with a global brand and European leader in the major consumer goods sector that is present in all five continents and more than 140 countries, Beko. We are united by a close and trusting relationship that began in the summer of 2014. Over this period, our club’s sporting successes and global projection have also been associated to the Beko image. And Beko is now positioned as a Main Partner along with Rakuten and Nike”. “This association with a world leader in its field is basic for continuing to lead the world football elite while we also tackle the development of our major equity project, the Espai Barça and the strategic projects that will strengthen our position and singularity on a worldwide level”. “We are pleased to be extending our relationship with FC Barcelona, one of the best football clubs in the world. Beko, like FC Barcelona, has made a huge effort throughout its history to improve standards and open new paths. We believe that sport has an incredible power to bring people together through shared values, team spirit and the challenge of bettering ourselves day to day. We are therefore proud to have FC Barcelona at our side, because we are working hard for even greater global growth and success over the next few years”. “I am delighted to be the ambassador for such an important and innovative campaign. As I started to compete at such a young age, I grew up appreciating the importance of a healthy diet and nutrition. And now as a father of two, it is even more important than before. Worldwide obesity statistics are shocking and do not look like they are improving, so I am proud to be working with Beko and my club to help to tackle this global problem”.